Tracing can be like a forensics procedural, only with fewer neat answers. There are many reasons for wanting to know who your ancestors are, from being curious as to where you came from; to needing to know medical conditions you may pass on to your own offspring; not to mention the complexities of recording nuances of personality and eccentricity. Fortunately, GenoPro has been designed with all this in mind. Making a family tree using GenoPro is simple, but making one that includes all the information you want and looks stylish will take a lot of work. When you first open GenoPro, you're hit with a paragraph of text designed to help you: a number of shortcuts and tips. However good your memory is, it's unlikely you are going to remember all of this—and you will need it—but it's okay. If you forget, simply go to File > New and it will reappear. GenoPro also opens with five different toolbars. It's a little daunting, but you can hide them all by visiting the View menu. Once you have GenoPro's UI under control, you can either import a GEDCOM file (GEDCOM is the standard Genealogical Data Communication format used by most genealogical software to share information) or start entering family information into the database. The Family Wizard (obtained by hitting the f key on your keyboard, or via the Tools menu) asks you for basic data—first, middle, and last names; date of birth; date of death—of father, mother, and children. This is generally the same process with any genealogy software program; you're populating the database. GenoPro's method is uncomplicated right off the bat, but there are a few items that are not clear. For example, there are many fields in the Children area that you can't access from the family wizard—and you may end up searching the help file. Just like Family Tree Maker ($40, an ancestry research tool), GenoPro will create an entire family tree including all the database entries and their relationships. Unlike Family Tree Maker, GenoPro creates the tree as you fill in the information; plus it allows you to work in the tree, adding people, changing dates, etc. It also will fit everyone within the tree in their correct relationship space (for example, your great aunt will always be connected to your grandparents), whereas Family Tree Maker can place people anywhere on the chart and use a key to link them. I like GenoPro's method, however it doesn't automatically keep generations aligned like Family Tree Maker, which may be a deal-breaker for some users. The genogram tools in GenoPro are very comprehensive (genograms are used to visualize hereditary patterns like health and psychological tendencies). There are a lot of indicators to choose from, and fortunately these are customizable. GenoPro is very functional, it's not pretty, and it can get frustrating very quickly if you have a lot of information you want to display. There are some very useful features though: you can generate a report in GenoPro that you can publish and view at any point in your research as an .htm file within a browser. The report includes all the information you've added to the database sorted by individual, family, family trees, timelines, and events. You can also publish this report online through your GenoPro.com account (a free service; your site may include pages as you wish, provided the content is related to genealogy) or via FTP to your own host. Each individual in the report has their own page, and all life events in the GenoPro database are displayed as a timeline—with images, occupations, and places if you've included them -- with hyperlinks to their parents, grandparents and siblings.If you want to chart something other than family pedigree -- familiar proclivity to abuse alcohol or dying of heart disease for example—GenoPro is the way to go; it's also a great way to create a utilitarian HTML file of your family without compromising your privacy. 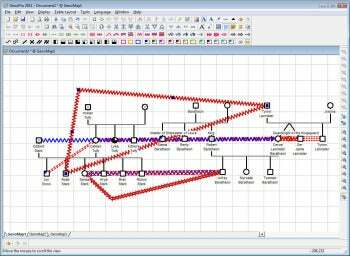 Make genograms of relationships or medical history--as well as regular family trees--with GenoPro.